(1) What is Health 2.0? (2) What are you doing to promote health data liberation? Many of the folks I spoke with used Todd Park's locution: ¡data liberación! I posted recently about one data liberation initiative; HHS, with Todd Park as CTO, is pursuing many more. Check out this playlist of eighteen very short video interviews, and meet some interesting people with cool ideas. Block out half an hour, or bookmark this page and listen to a few at a time. I spoke with Regina Holliday, Jane Sarasohn-Kahn, Ramin Bastani, Janice McCallum, Ash Damle, Sunnie Southern, Mathew Browning, Mark Scrimshire, Alex Fair, Christine Kraft, Lygeia Ricciardi, Andre Blackman, Matthew Holt, Jef Kozloff, Farzad Mostashari, Paulo Machado, Joe Flower and Nikolai Kirienko. Each of them has something important to say, and each comes at these questions from a different perspective — patient, entrepreneur, activist, government official, disruptive innovator, thinker, consultant. 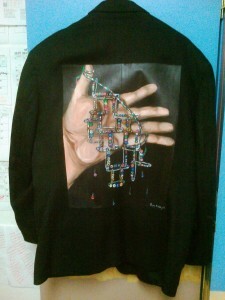 Those who were wearing jackets painted by Regina Holliday show them off before starting to answer the two questions. Health 2.0 San Francisco, September 2011, "Son et Lumiere"